1974 Mustang - history,performance,how-to's and more. The 1974 Mustang was marketed as the Mustang 11, the rebirth of the Mustang. A smaller, more nimble car, more like the smaller and much lighter classic Mustangs. Getting back to its roots and moving away from the traditional Detroit land yachts. Billed as the right car at the right time, just like the original 1965 Ford Mustang. Back were familiar names such as the Mach 1, hardtop and the 2+2 (the original term for the fastback cars). Replacing the Grande, was the Ghia and the new 2+2 was now a hatchback. But the days of the horsepower wars were over. Gone were the fabulous horsepower claims and big block motors. in the redesigned 1974 Mustang. The entire performance landscape for the venerable pony car had changed in more ways than one under the hood. More of Ford's thought and design engineering went into dealing with America's new mandated 5 mph bumper laws and safety regulations, a problem causing cars to become heavier which ultimately affected performance and fuel economy. America's cheap gas was starting to evaporate and fuel economy was fast becoming an important consideration for North American cars, including the Ford Mustang. Worsening things, newer stricter emission controls to reduce airborne pollutants and hydrocarbons were putting a noose on the necks of the popular V8 engines, making them anemic, compared to even a few years earlier. Sadly, the horsepower wars were over (for now). 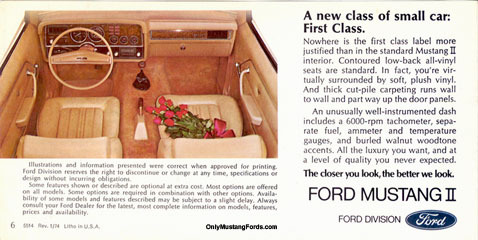 "Quality", "elegance" and "Luxury" were the new buzz words for the 1974 Ford Mustang. Although Ford's marketing leaned heavily on it's new suspension design at the front and now standard front disc brakes, the new Mustang was also based on the cheapest car FOMOCO produced at the time, a grocery getter, better known as the Pinto. Now that's not to say the new smaller 1974 Mustang was not full of potential, nor is it to say that some of these changes were not for the better. In hindsight, the new front suspension was dramatically better than the one it replaced and remains a favorite retrofit for classic Mustangs, Hot Rods and even Kit Cars for improving handling and braking. While the 1974 Mustang 11 was a product of expensive gas,onerous new pollution control laws, tougher bumper laws, sales for the new car were trememdous. With almost 400,000 pony cars rolling off the line that year, sales had not seen these levels since the 1966 model year! Beyond the change in size of the passenger compartment, there were dramatic changes to the look and feel of the new Mustang's interior. What's not to like? The new, smaller pony car featured soft vinyl seats, or Westminster Cloth in Ghia models, a pleasing lack of idiot lights, adding a 6000 rpm tachometer, real temperature gauge, ammeter and "wood tone" inserts in the instrument panel, similar to the previous generation Deluxe interior package. 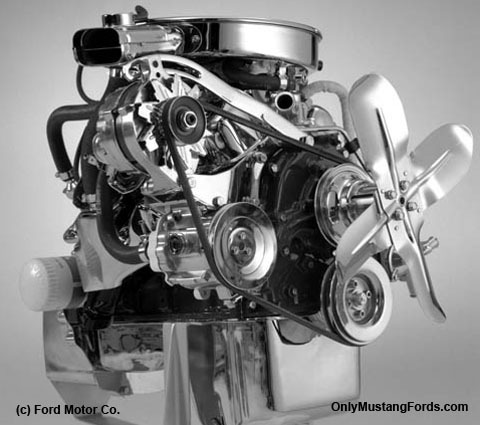 Ford's performance option for the little 1974 Mustang was in the form of the 2.8 liter V6, which was said to borrow its refinements from the European Ford Capri. Now,I've driven both, and something got lost in the translation. Quarter mile times for the V6 were just under 19 seconds for the 4 speed and about 19.5 for the automatic. The all new economy engine was a new "metric" 2.3 liter four cylinder (140 cubic inch) motor dished out a thundering 88 horsepower with a stump pulling 118 pounds of torque. Interestingly though, the new car, weighing in at around 2600 lbs for a stripped four cylinder car, performed in the same league as you could have expected with an inline 6 cylinder equipped 1973 Mustang! The Mustang II was 19 inches shorter and almost 500 lbs lighter than the 1973 car it replaced. The convertible was gone, not to return for another six years. The available versions were the coupe,now called a notchback,and a 2+2 fastback,instead of a sports roof. The Ghia model was the replacement for the Grande and was to be a smooth riding little luxury cruiser. It also featured its own vinyl roof treatment and logo. Like the outside,the interior for the Ghia was dramatically different. Smaller, with a slant towards a more European feel, with a simulated wood dash and instrumentation as well as the usual idiot lights. Like its Pinto cousin, the Mustang shared the new for a pony car rack and pinion steering steering system, but unlike the pinto, it had its own front sub frame that was separately mounted to the body. Spring rates were calibrated for the different combinations, with the softest spring rates dialed in for the Ghia. Pretty much everyone but Ford expected the new Mustang's sales to be flat. Surprisingly, much of it's sales success, came in the form of the 1973 Arab Oil Embargo. The crisis affecting oil and gas supplies in America was caused by a splinter group of Arab members of OPEC, banding together, to cut off oil supplies to the US and Western Europe, for supporting an emergency supply efforts to get oil to Israel, so it hold off attacking Egyptian and Syrian forces. Ford's marketing was on the money. Love it or hate it, the 1974 Mustang really was the right car at the right time.